Putting points on the board when working inside of the 20-yard line is paramount for offenses to have success, which is, of course, much easier said than done. Here, we preview the league’s best offenses, from both a passing and rushing standpoint, at getting the job done in the red zone. Passing red-zone grades from a team perspective are highly influenced by the play at the quarterback position. As such, the New England Patriots’ spot atop this list is largely fueled by veteran signal-caller Tom Brady’s performance inside the 20-yard line in 2017. Brady earned the second-ranked passing grade inside the red zone (82.8) last season, ranking first in total red-zone touchdown passes (33) and third in adjusted completion percentage (74.1) among qualifying quarterbacks. His two turnover-worthy plays in the red zone kept him from the top spot in terms of passing grade, however, Brady’s efficiency and overall production were remarkable. 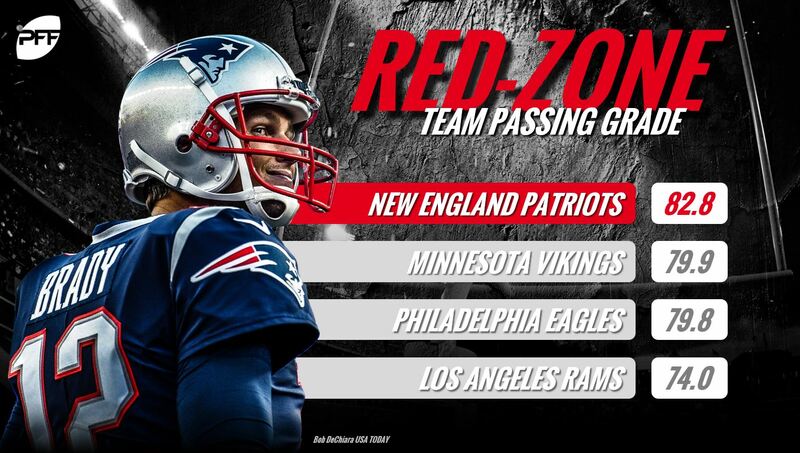 Patriots pass catchers Rob Gronkowski, James White, Rex Burkhead and Dion Lewis all contributed to the team’s first-ranked offense grade in the red zone. Lewis and Burkhead both earned 90.0-plus receiving grades and combined for six red-zone touchdown receptions on limited snap counts. Gronkowski and White did the heavy lifting, combining for 13 red-zone touchdowns across 155 red-zone snaps. Like New England, the Minnesota Vikings benefited from solid quarterback play inside the red zone. Quarterback Case Keenum earned the third-ranked passing grade in the red zone (79.8) among qualifying quarterbacks in 2017. However, perhaps Keenum’s supporting cast deserves most of the credit. Both tight end Kyle Rudolph (87.6) and wide receiver Stefon Diggs (86.9) earned 86.0-plus receiving grades in the red zone this past season. The duo combined for 27 receptions (33 targets), 211 yards, 14 touchdowns and six first downs when targeted inside the red zone in 2017. Also, neither Rudolph nor Diggs dropped a catchable target, and Diggs, to his credit, managed to haul in all five of his catchable contested targets for touchdowns. Prior to Carson Wentz’s injury, the Philadelphia Eagles’ red-zone passing offense was practically unstoppable. Wentz earned the highest red-zone passing grade (90.1) before going down with a torn ACL in Week 13, and three of his teammates (Zach Ertz, Alshon Jeffery, Nelson Agholor) had top-10 receiving grades inside the red zone among qualifying pass catchers through Week 13. While the Eagles’ pass catchers maintained their high receiving grades in the red zone beyond Week 13, Wentz’s replacement, Nick Foles, though an eventual Super Bowl MVP, did not have the same success as Wentz in the red zone. Foles earned just a 51.3 passing grade in the red zone from Week 14 onwards, making a lot of expected throws and few big-time throws in the process. The Los Angeles Rams’ efficiency in the red zone, or at least a significant portion of it, should be credited to the masterful play calling of 2017 NFL Coach of the Year Sean McVay. McVay’s understanding of defensive tendencies often put sophomore signal-caller Jared Goff into a position to succeed. In fact, no quarterback threw more open throws – categorized as throws made to pass catchers with at least one step of separation from the nearest defender – than Goff with 37, and 13 of Goff’s 24 red-zone touchdown passes were on open throws. Goff did have six big-time throws and limited his turnover-worthy throws to one inside the red zone, while his 76.5 passing grade ranked fifth among qualifying quarterbacks. Goff’s go-to guys in the red zone in terms of targets, Cooper Kupp and Sammy Watkins, accounted for 14 total red-zone touchdowns and earned 65.0-plus receiving grades, respectively. 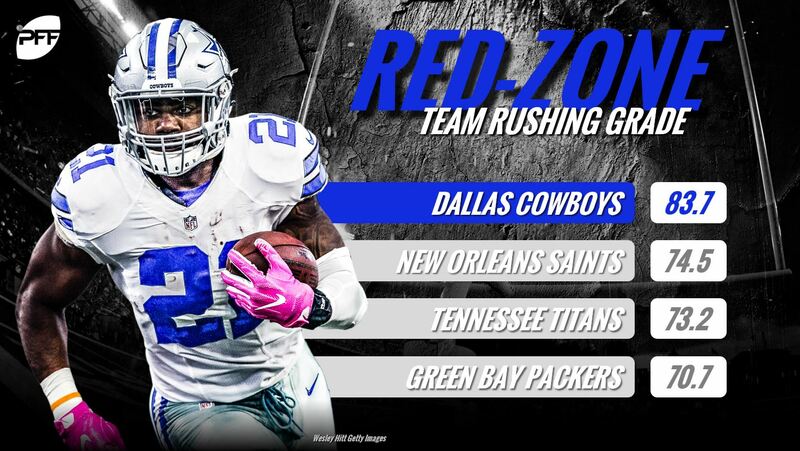 Leading the charge for the Dallas Cowboys’ top-ranked rushing offense in the red zone, third-year running back Ezekiel Elliott was one of the most efficient runners inside the 20-yard line this past season. He rushed for six touchdowns and seven first downs across 40 red-zone attempts en route to a 79.3 rushing grade. He also forced five missed tackles and averaged 1.9 yards after contact per attempt on said carries. Cowboys quarterback Dak Prescott also contributed on the ground inside the red zone in 2017, as he earned the top-ranked rushing grade (81.3) among quarterbacks with at least five attempts inside the red zone. He turned six red-zone carries into three touchdowns and two first downs. New Orleans Saints rookie running back Alvin Kamara could do no wrong in his debut season in the NFL. In addition to torching defenses in the passing game and breaking off explosive runs, Kamara was efficient with his red-zone opportunities. He tied for fourth in rushing grade (80.0) and amassed seven touchdowns and four first downs on 29 red-zone carries in 2017. He also forced seven missed tackles and averaged 2.8 yards after contact per attempt on those carries. Similar to Prescott and Elliott, Tennessee Titans’ Marcus Mariota and Derrick Henry were quite the dynamic duo in the red zone in 2017, as they combined for five touchdowns and five first downs on 41 carries. Mariota and Henry earned 79.3 and 68.5 rushing grades, respectively. The Titans’ red-zone rushing offense could be headed for even better things in 2018, having added former Patriots running back Lewis to the fold this offseason. Lewis totaled six touchdowns and five first downs across 39 red-zone carries en route to a 68.6 red-zone rushing grade with the Pats in 2017. Aaron Jones and Ty Montgomery were efficient when given the opportunity to carry the ball in the red zone this past season. Jones and Montgomery earned 77.2 and 71.7 rushing grades, respectively, despite combining for just 21 red-zone carries as a duo. Teammate Jamaal Williams received the bulk of the red-zone carries, earning a 60.2 rushing grade on said carries. Green Bay still managed a top-four rushing grade in the red-zone with Williams’ underwhelming efficiency but expect the team to put their best foot forward in 2018 – said foot being an increased workload for Montgomery and Jones in the red zone.